Click here for more information on the Great Allegheny Passage. TAKE A RIDE ON THE NEAREST RAILROAD! Start your trip with an overnight stay in Cumberland and enjoy our Friday After Five outdoor music, dining and activities in Downtown Cumberland. 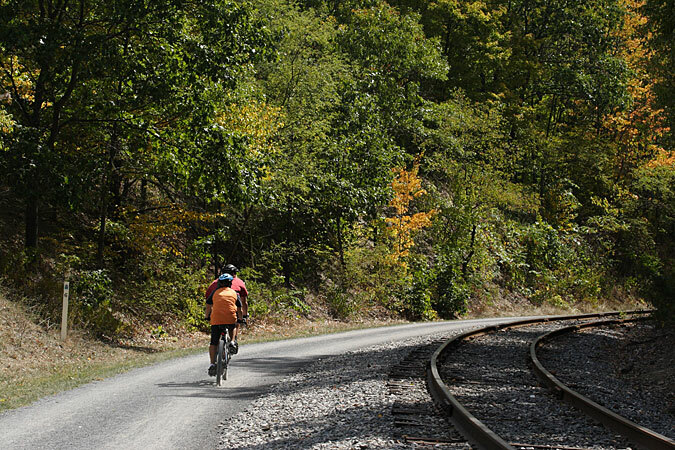 Depart Saturday on a ride with your bike on the Western Maryland Scenic Railroad from Cumberland to Frostburg. 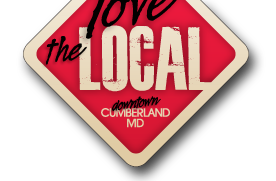 Once in Frostburg visit that Historic Town then enjoy a leisurely 15-mile downhill ride back to Cumberland for the Saturdays Live Concert at Canal Place and the charming shops downtown. Click here for more details. Start in Frostburg for a 12 mile round trip to see the 3200 foot Big Savage Tunnel, the Mason Dixon Line and scenic vistas from atop the mountain. Finish with a nice lunch and shopping in Historic Frostburg before you head back home. Best of both trails. Start in Cumberland, head up the Great Allegheny Passage 6 miles to the Brush Tunnel. Experience Helmstetters Horseshoe Curve and the Narrows, then head back to Cumberland and onto the C&O Canal Towpath. See Evitts Creek Aqueduct and several locks depending on how far you want to go toward Washington. Ride the C&O Canal Towpath from Cumberland to the 3118 foot Paw Paw tunnel, 35 miles one way. Bike back to Cumberland or have one of our shuttle services bring you back. Make sure you stop and enjoy lunch at the Schoolhouse Kitchen in Oldtown. Shuttle to the Eastern Continental Divide to the highest point on the trail and ride the 24 miles downhill to Cumberland. Pass through the Big Savage Tunnel and over the Mason Dixon line, then stop in Historic Frostburg. Continue downhill into Cumberland and enjoy the night life in the downtown arts and entertainment district. JOHN HENRY WAS A STEEL DRIVIN' MAN! Ride from Cumberland to Frostburg, right alongside the steam Engine of the Scenic Railroad. This is the only place along the trail to experience the side by side thrill of a real moving train. Come see for yourself where transportation of old meets with new. You’ll climb approximately 1750 feet along 17 miles of rail trail. Click here for Western Maryland Scenic Railroad schedule.